Back on track after a few weeding days. It's hot now and printing moku-hanga is just not nearly as fun as it was in the winter. Just a bit too stressful to try to keep everything the right dampness when humidity dips into the 4-8% range. Sigh...my kingdom for a HUGE humidifier. Nevertheless, we plow on with plastic and spray bottle handy. 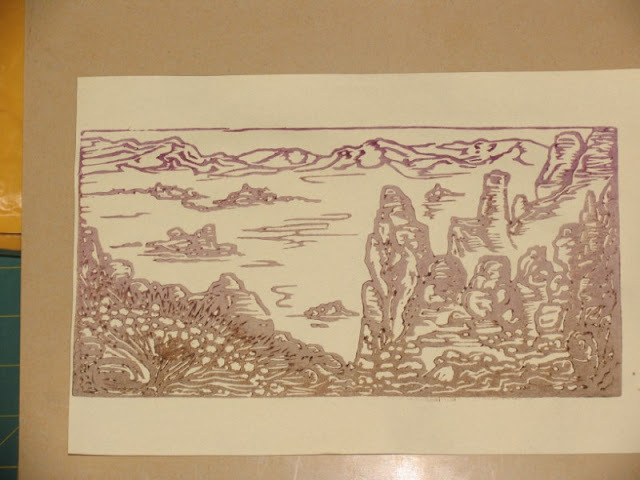 Key block is now printed in a gradient from raw umber to violet; what the heck, time to get fancy even if lacking in skill. What's the saying? "Never mind that the horse is lame...load the wagon!!!" This proof is a bit messy on the bush, my fault for having clumsy paws today. But I was pleased with the gradation from rock to mountain. Tomorrow the first color or two if I feel energetic enough.